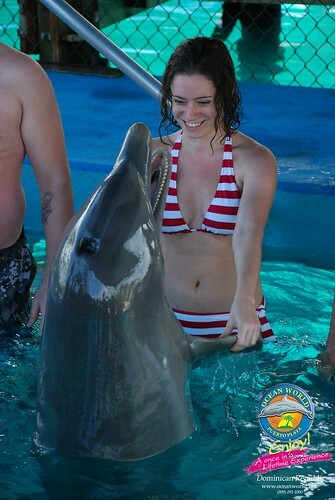 Puerto Plata – and then there as that time I HUGGED A DOLPHIN!!! 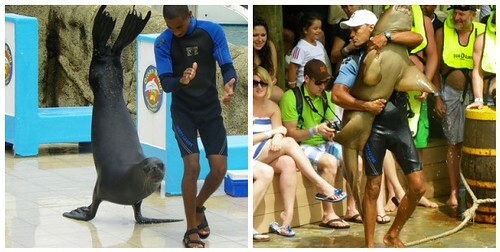 Sea lion!! And yes, that’s a shark he’s carrying on the right. And also birds!! The bird show was actually pretty hilarious. My favorite picture is of the one bird pulling the other in an “ambulance” hahahaha. 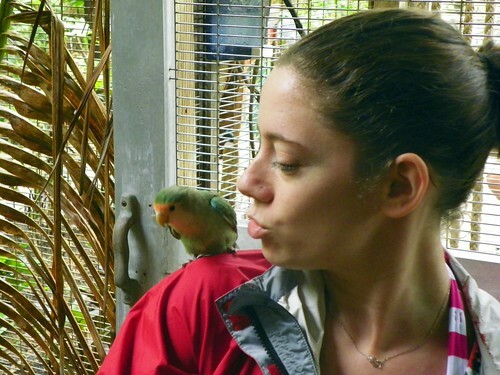 We also spent some time in the bird sanctuary, where I became enamored with the little lovebirds!!! OMG they were SO cute. If I didn’t think birds were annoying pets, I would so get one (or two). 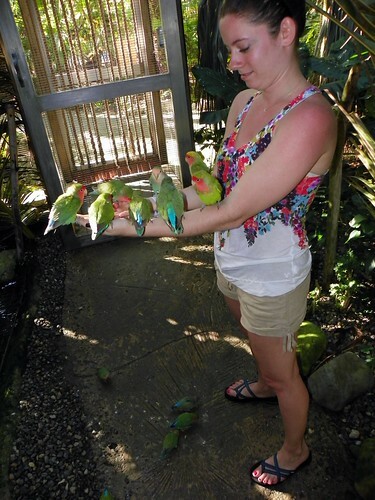 And the staff would give you bird seed to feed them, and they SWARMED to get it! I made Dave go twice so I could play with the cute little birds some more. An then, finally, it was time for our DOLPHIN ENCOUNTER!!!!!!!! We didn’t swim with the dolphins, since it as like $50 more a person, so standing in a shallow pool with them would suffice enough. And well, I’ll let the pictures speak for themselves! Dave doesn’t believe me, but the dolphin (whose name was Chico, btdubs) and I are BFF for life now. Our kiss sealed the deal. Dear god I love these pictures. Dave loves these pictures because he says my “OMG I’m hugging a dolphin YAYYYYYYY”!!!! face is hilarious. I seriously loved it. (And got to cross it of my Life List! Woo!!) It was AWESOME. 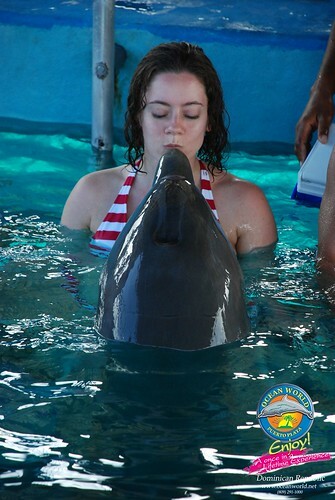 Have you ever done a dolphin encounter or something similar? They also had a shark encounter, and stingray encounter at the park, but the dolphins were all I wanted. 🙂 They are far cuter, after all. Ohmygoodness, this is so cool! I pet a dolphin once, but it wasn't nearly the same as HUGGING one. So jealous! We used to have an Ocean World in Miami. One time I was on some school field trip, probably to the Miami Seaquarium, and I was picked out of the crowd to jump into the dolphin tank and have the dolphin smiw over to me and pick me up or something. I was so excited and I aked the guy, "so I just jump and he comes over to me?" And he was all yeah, yeah, sure. Like a second before I actually did it, I remembered I couldn't swim. Seemed like an important detail. 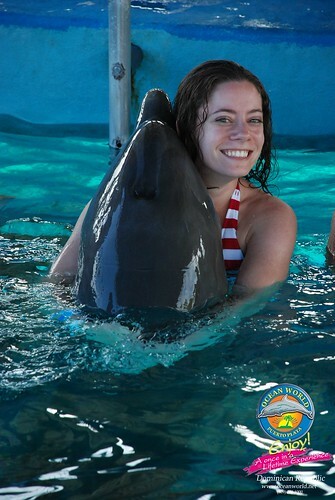 While I am horrified at the pictures of you covered in birds, I am COMPLETELY JEALOUS that you got to cuddle with a dolphin. Also, that sea lion! So cute! These photos are THE BUSINESS. Love them so much. Holy crap that looks like so much fun!! love these pics! i would flip my s–t if i ever got to hug a penguin. seriously. The dolphin pics are soooo cute! 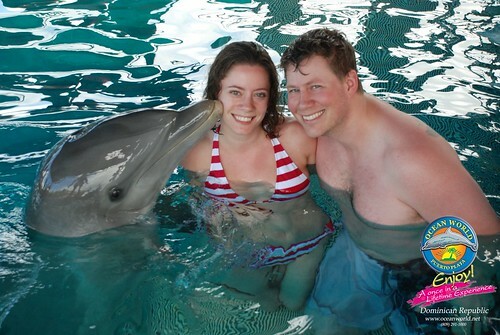 and to be honest i'd rather just pose with a dolphin than swim with one. aw the dolphin pictures are so fun! totally makes up for how nervous i am just looking at the bird pictures, haha (i am so not a bird person). but the dolphin, amazing. 2- That shark? It had to be FREAKING OUT. "findahappyplace findahappyplace findahappyplace!" Amazing! I have always wanted to swim with dolphins, haven’t made it yet.